I fear Mad Hippie may have a Marketing problem. Let me start off on a high point, by saying that I LOVE their products. Like, a lot. I gave it over a month to make sure it wasn't a fluke, but it isn't. Their products work great, more on that later. Right now, I have an issue with their naming of the products/line, and this comes from me wanting to see a line that I really really like not fail b/c they didn't ask ANYONE for a second opinion. For starters, the name of the brand. I'm thrilled to see that someone had the good sense to not name it "Dirty Hippie" (c'mon, this is what everyone first thinks when they hear hippie. Right? Right??? ), but I'm quite sure "Mad Hippie" isn't that far ahead. 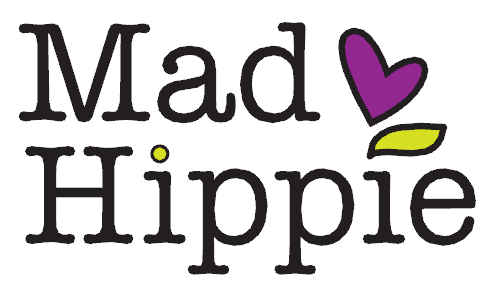 Either it conjures images of an angry hippie, and while this is a delightful oxymoron to imagine, it probably isn't the "Mad" they were going for. More likely, "Charmingly Insane Hippie" was the motive, but only brings up visions of a crazy cat lady decked out in patchouli and armpit hair, aka not who I want selling me face cream. It is not high end, and this stuff should be because it is awesome. But please don't raise the prices. The packaging is a bit twee for me as well, but whatever. They're hippies. Onto the product review! I will be mostly reviewing them together, because they are meant to go together, Serum before the Face Cream. No idea if one of them is doing all the hard labor and the other is getting credit for it, but judging by their ingredient lists, I bet this is not the case. I have pretty average skin: combination, with occasional mild breakouts and a few lines around the eyes. Within a week of using them (I use the serum day and night, the Cream only at night), my skin had cleared up a bit and had a glow to it. I always get really suspicious when I read a review and someone says it gave them a glow, because that seems like a big fat lie, but now I get what they're saying. My skin just looked more alive, without the help of makeup, and it had more of an even quality to it. I have not noticed a huge change in wrinkles, but mine are pretty mild right now anyways. The big test was when I went away for 5 days last week, and didn't bring the products (I was scared the glass Serum would break.) My skin started to break out more, but now that I'm back and using them again, it is clearing up, like hippie magic. The Serum is very light and easy to apply, not very oily or thick but more like a light gel. It also has a really neutral, fresh smell, but VERY mild. Just use a few drops, even though I know it looks fun to squirt that whole dropper in your hand, but don't because that is like $3 worth of fun. Go spend your fun elsewhere. The Face Cream is also pretty light for a cream, and the pump works really well (I have worked for two different well-known Beauty companies, and you would be shocked at how many pumps do not work, and people get SO ANGRY about it. Like, cursed our unborn children angry. ) It absorbs within minutes and doesn't make my skin oily, but it also helps with tightness due to dry skin. It also has a really light, neutral smell that is very natural and kind of floral. LOML normally hates natural products because they smell like Tea Tree oil or other strong essential oils, but this is LOML approved. I would guess the products would last around 3- 4 months, based on how far I am into them, as you don't need to use a ton. I would love to try their other products, because never before have I noticed a difference so fast. I also LOVE that they are natural with quality ingredients (see below for full ingredients), and pretty affordable, around $26 each. If I ever become rich, I will apply these all over and cackle on a daily basis, as my bathroom ghost watches on because Mad Hippie just did not hold up their end of the bargain. On Amazon, you can buy Vitamin C Serum here and the Face Cream here. Check out their website for more information at http://www.madhippie.com/.